In 2000, Eurocopter EC120 B c/n 1144 was testflown with Eurocopter France test registration F-WQDC. In October 2000, the helicopter was registered D-HUAE in Germany with Heli Unionair Fluggesellschaft mbH, Ottensoos. In September 2002, EC120 B D-HUAE was registered with Eurocopter Deutschland GmbH. In 2009, the D-HUAE was transferred to HTM-Heli Travel Münich. In November 2013, HTM leased the EC120 B D-HUAE to Heliventure FTO (tradingname helicopterflights.be) in Belgium, and on 11 November 2013, the D-HUAE entered service with helicopterflights.be. On 2 December 2016, the EC120 B was registered OO-DTE in Belgium with Heliventure FTO, Lint, as owner. 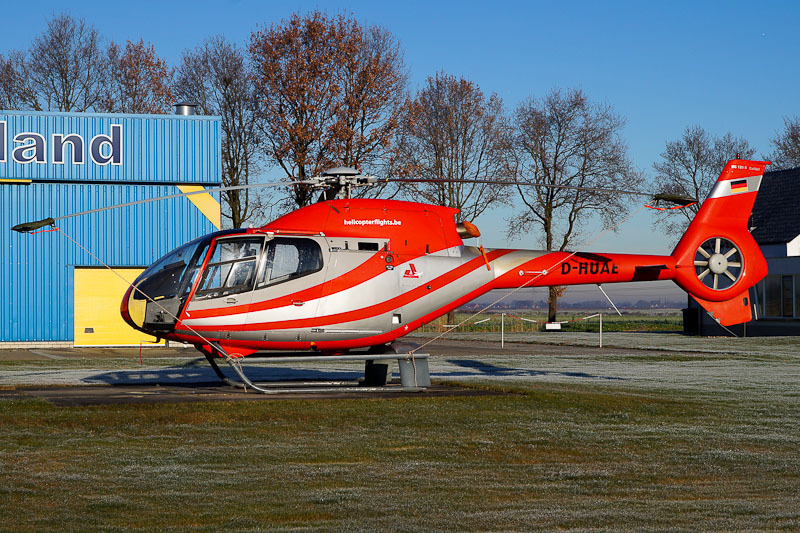 The helicopter was seen parked as D-HUAE at the Heli Holland heliport in Emmen, the Netherlands.